This article is about the children's novel. For the George Winston/Meryl Streep album, see The Velveteen Rabbit (album). The Velveteen Rabbit (or How Toys Become Real) is a British children's book written by Margery Williams (also known as Margery Williams Bianco) and illustrated by William Nicholson. It chronicles the story of a stuffed rabbit's desire to become real through the love of his owner. The book was first published in 1922 and has been republished many times since. The Velveteen Rabbit was Williams's first children's book. It has been awarded the IRA/CBC Children's Choice award. Based on a 2007 online poll, the National Education Association named the book one of its "Teachers' Top 100 Books for Children." A stuffed rabbit sewn from velveteen is given as a Christmas present to a small boy. The boy plays with his other new presents and forgets the velveteen rabbit for a time. These presents are modern and mechanical, and they snub the old-fashioned velveteen rabbit. The wisest and oldest toy in the nursery, the Skin Horse, who was owned by the boy's uncle, tells the rabbit about toys magically becoming real due to love from children. The rabbit is awed by this idea; however, his chances of achieving this wish are slight. One night, the boy's nana gives the rabbit to the boy to sleep with, in place of a lost toy. The rabbit becomes the boy's favorite toy, enjoying picnics with him in the spring; and the boy regards the rabbit as 'REAL'. Time passes, and the rabbit becomes shabbier but happy. He meets some real rabbits in the summer, and they learn that he cannot hop as they do and say that he is not a real rabbit. One day, the boy comes down with scarlet fever, and the rabbit sits with him as he recovers. The doctor orders that the boy should be taken to the seaside and that his room should be disinfected—all his books and toys burnt, including the velveteen rabbit. The rabbit is bundled into a sack and left out in the garden overnight, where he sadly reflects on his life with his boy. The toy rabbit cries, a real tear drops onto the ground, and a marvelous flower appears. A fairy steps out of the flower and comforts the velveteen rabbit, introducing herself as the Nursery Magic Fairy. She says that, because he has become Real to the boy who truly loves him, she will take him away with her and "turn [him] into Real" to everyone. The following adaptations have been made of The Velveteen Rabbit. In 1973, LSB Productions made the classic, original 16mm film version with a running time of 19 minutes. It won the Chris Plaque Award, the Silver Plaque Award, and the Golden Babe Award, and it appeared at the Columbus Film Festival, the Chicago International Film Festival, and the Chicagoland Film Festival. It was a finalist at the American Film Festival. This film has been on TV and has been acclaimed by parents and teachers worldwide. The 1976 Rankin/Bass television special The First Easter Rabbit adapts the plot of the book as first of part of its story of how a toy bunny is recruited as the Easter Bunny. In 1984, it was part of the Enchanted Musical Playhouse series, where Marie Osmond played the part of the Velveteen Rabbit. Songs were composed by the Sherman Brothers. The Velveteen Rabbit was adapted into a video recording and soundtrack in 1985 by Rabbit Ears Productions with Random House Video; narrated by Meryl Streep, with music by George Winston. It received a Parents' Choice Award for Multimedia and was a Grammy award nominee. The first, narrated by Christopher Plummer, was produced in Canada by Atkinson Film-Arts for CTV. This version aired in the United States on HBO. The second was produced by Hanna-Barbera Australia and broadcast as an ABC Weekend Special. In 2003, it was adapted into a clay-animated film by Xyzoo Animation. In 2007, a live-action short film adaptation was released by Horse Fly Studios. It was nominated for two Young Artist Awards. Feature Films for Families, Family1 Films and Believe Pictures released their adaptation in 2009. It is distributed by Anchor Bay Entertainment, Thomas Nelson and Vision Films. The film adaptation was illegally telemarketed to over 500,000 telephone subscribers in the United States. Verizon successfully sued Feature Films For Families for the practice. In October 2015, Atlantic Theater Company produced a new musical adaptation of The Velveteen Rabbit at The Linda Gross Theater. This production was adapted by Anya Saffir (book and lyrics) and Cormac Bluestone (book, lyrics, music). In December 2018, Magic Light Pictures was reported to be adapting Velveteen Rabbit as a Christmas special. It will be the company's first live action/animated production. ^ "Margery Williams - The Velveteen Rabbit at Embracing the Child". Embracingthechild.org. Retrieved 2009-09-13. ^ Williams, Margery. "The Velveteen Rabbit, By Margery Williams , Illustrated by William Nicholson: HarperCollins Children's Books". Harpercollinschildrens.com. Retrieved 2009-09-13. ^ Barrett, Rick (2009-02-27). "Telemarketer sued for cell-phone calls". JSOnline. Retrieved 2009-09-13. ^ "Atlantic Theater Company Atlantic for Kids presents The Velveteen Rabbit: A New Musical". Atlantic Theater Company. ^ Zahed, Ramin (2018-12-13). "Magic Light Pictures Hops to 'Velveteen Rabbit' Hybrid Adaptation". animationmagazine.net. Retrieved 2019-04-16. 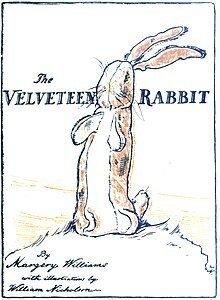 Wikimedia Commons has media related to The Velveteen Rabbit.